Since my oldest was born, our family tradition has been to open Christmas pajamas the night we decorate our Christmas tree. We love this tradition and we love share our pajamas with our readers. Like last years Sleepyhead Nightgown pattern and our Reindeer Pajama Applique. This year I really wanted to make a comfy raglan t-shirt pattern for our pajamas. 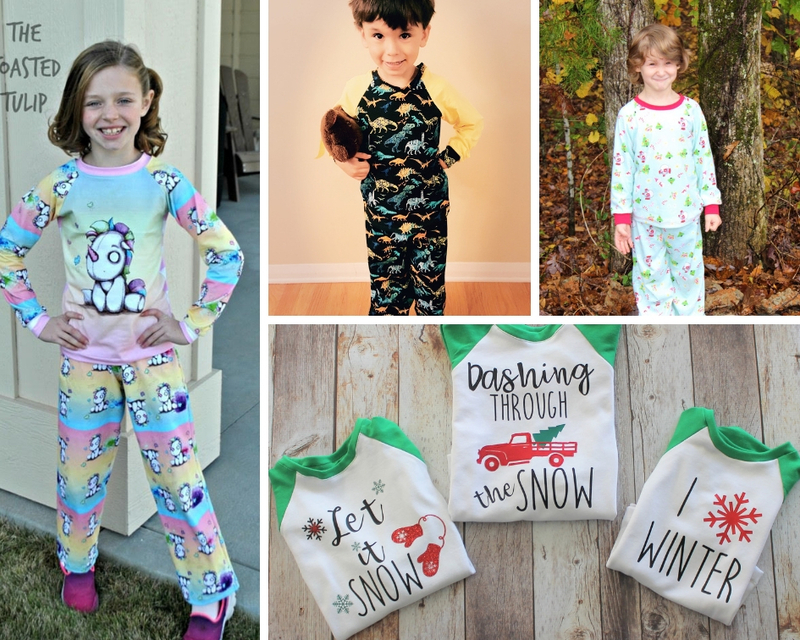 As a gift to my AMAZING GYCT readers, I'm offering the pattern pieces for our new Happy Holiday Pajamas Pattern for FREE!! I personally LOVE raglan tees. They are comfy, quick to sew and look great on almost everyone. Kids love them and since you can do a bit of color blocking they are perfect for adding fun designs, images or sayings on the front. Like our fun Christmas SVG cut files we added to our shirts. It really makes this raglan t-shirt pattern custom and special. And honestly, who doesn't love a fun custom tee to go with the holiday season? Plus, custom tees are so easy to make with the Cricut Maker. Not only for holidays but for school, work and just for fun! But my favorite part about this raglan t-shirt pattern is that I am offering it this Christmas for FREE!!! 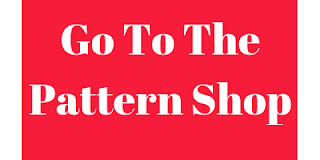 You can claim your pattern pieces by clicking the link below. The pattern comes in sizes 12 month - 12 years. 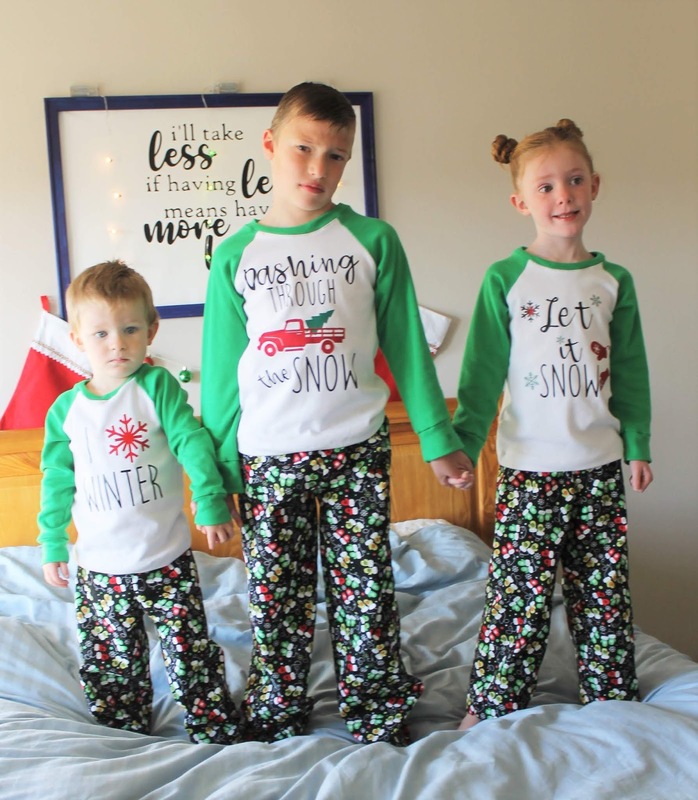 This pattern was also tested by a great group of sewists that say all their little ones loved their new pajamas! Check out more photos. 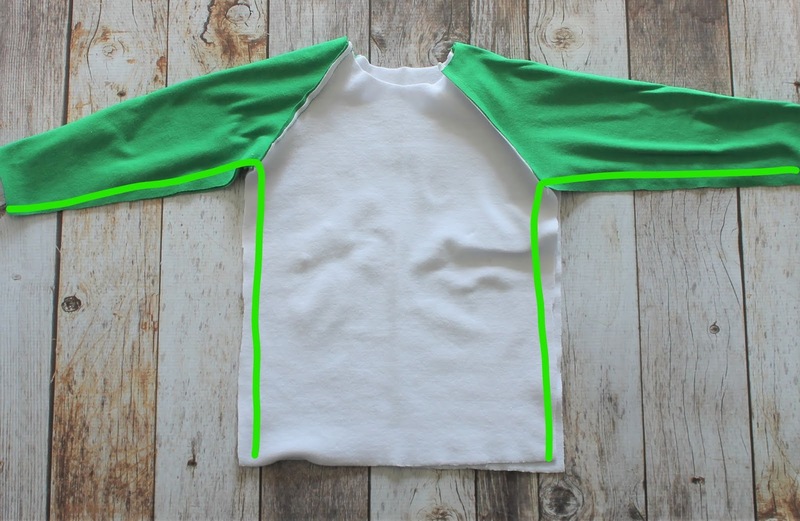 Once you've grabbed your pattern pieces, just come on back here and I'll walk you through the steps to sew up your raglan t-shirt and our free pajama pants pattern. With Right Sides Together (RST), match the sleeve and the bodice front. Stitch sleeve to bodice. With RST, match the same sleeve with the bodice back. Stitch sleeve to back. Repeat with opposite sleeve. Take one sleeve band and fold it in half with short sides together. Stitch across. Fold band with wrong sides together to make a circle. With RST, match the raw edges of the sleeve and band. Pin in place. With RST, place neckband over neck edge of the top. Match the seam of the neckband to one of the back bodice seams. Find the middle of the neckband and match it to the opposite front seam. Pin rest of neckband in place. You may need to stretch the neckband slightly as you pin for it to fit properly. Stitch neckband to shirt. Turn the bottom edge of the raglan t-shirt pattern up ½” towards the wrong side of the fabric and press. Using your double needle, zig zag or stretch stitch, topstitch around the hem of the bodice. Press. There's your fun Christmas pajama top! I love a quick raglan t-shirt pattern. This one is perfect for pajamas too! Head over to page 2 to get the pajama pant tutorial. 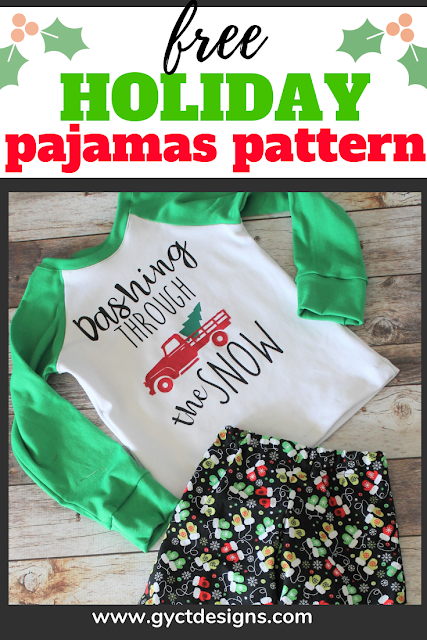 And don't forget to grab the free Happy Holiday Pajama Pattern Pieces. Don't want to come back here for the tutorial? You can grab the pattern in our pattern shop for $2 this holiday season. This includes the full tutorials for top and pants and the pattern pieces.